Description: The Dollar Sign series from 1982 was the ultimate manifestation of Andy Warhol’s love affair with money. Warhol once said, “I like money on the wall.” and the Dollar Sign Series was his way of using his iconic imagery to achieve just that. The series is comprised of multiple variations of dollar sign screen prints on Lenox Museum Board in a variety of vibrant colors. The Dollar Sign paintings contain a source image that was created by Warhol himself which was an uncommon practice for Warhol, as a result this series sets itself apart from a large portion of the rest of his body of work. 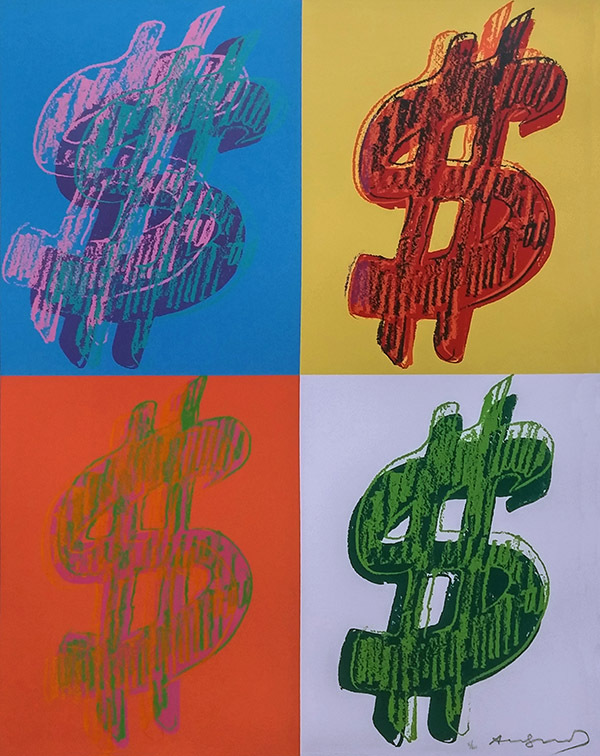 The Dollar Sign Series is a superb example of Warhol seizing a internationally recognizable symbol and altering it into something that was purely Warholian. Unique screenprint on Lenox Museum Board. Hand signed and numbered in pencil. Printed by Rupert Jasen Smith, New York. Artwork is in excellent condition. Certificate of Authenticity included.